Provided site planning/engineering for a 721,000 SF building that can be expanded to one million square feet. 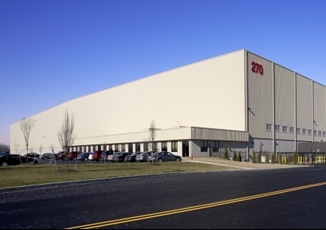 Estimated at $75 million by NJBIZ, this distribution warehouse has a 68-foot product storage height and 80-foot overall height, making it the tallest warehouse/distribution building in New Jersey. The project was completed in 18 months and is located in Haines Center, a 900-acre industrial park owned and managed by Whitesell. The Haines Center Industrial Park is serviced by the Neck Road Pumping Station. Public Works – Burlington County, New Jersey. CES worked closely with public officials on this project that included replacement of the outdated Neck Road pumping station to a suction lift pumping station that is rated at 400 gpm. The station serves the new Haines Industrial Park, owned by Whitesell. This station included duplex pumps located within a control building, controls, check valves and isolation valves, and pig launching chamber. Outside of the building is an 8-foot diameter precast concrete wet well, and 80 linear feet of 8-inch DIP force main that will be tied into an existing force main.